All SolarVu® features are included for the first 2 years with the purchase of a SolarVu® portal. After that time, monitoring continues to be free and lifetime data is stored. Advanced diagnostic Analyzer tools and SMART Enterprise reporting are available for a monthly charge with a SurePoint™ subscription. These useful tools help field maintenance personnel quickly diagnose and fix faults to prevent loss of revenue. Performance analysis and custom reports let financial staff efficiently monitor portfolio returns. SurePoint™ can be activated at any time with flexible monthly payments or prepaid annually using a credit card, online transfer or by invoice. Large portfolio owners can contact Cachelan for a multi-site discount and preferred payment plan. Features requiring a SurePoint™ subscription will be identified by a SurePoint™ logo with the days remaining displayed. Click the Days Left bubble for detailed status. Price varies with system complexity and will be shown on this screen. 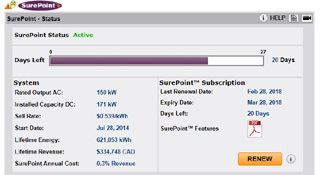 On the SurePoint™ status screen, click the Renew button to extend the subscription. On renewal, additional days will be added to the remaining available days. Email contactus@cachelan.com or phone 905.470.8400 for further information or assistance with a SurePoint™ subscription. 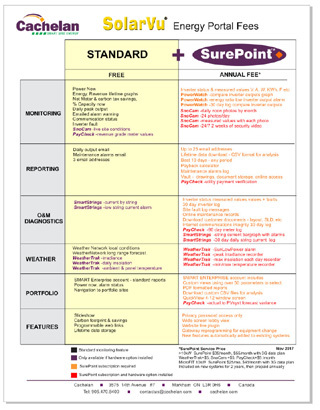 Download the SurePoint™ features list. Price is calculated based on installed options and displayed on the renew screen. Click the SurePoint™ logo Days Left bubble or Analyzer tab - SurePoint™ to view the subscription status or to renew." When a SurePoint™ feature is accessed but the SurePoint™ subscription has expired, a message will be displayed with a link to view the benefits of the missing feature. Click the RENEW button on the SurePoint™ status screen to reactivate SurePoint™.